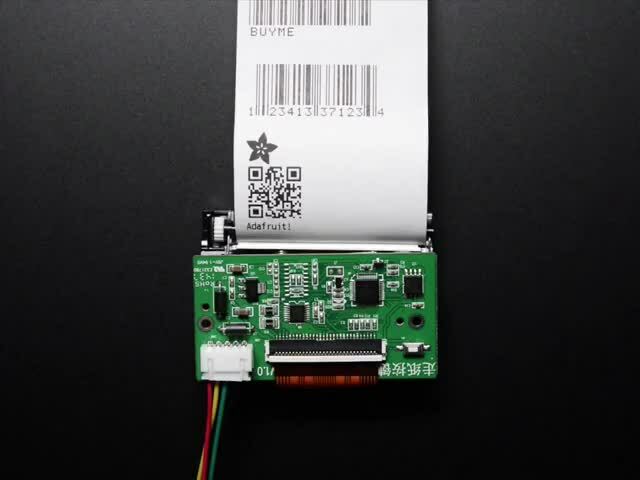 It's easy to use the thermal printer with CircuitPython (or Python) and the Adafruit CircuitPython Thermal Printer module. This module allows you to easily write Python code that controls the printer, like printing text and barcodes (note right now bitmap printing is not supported by CircuitPython code). First wire up a thermal printer to your board with a serial connection exactly as shown on the previous pages for Arduino. 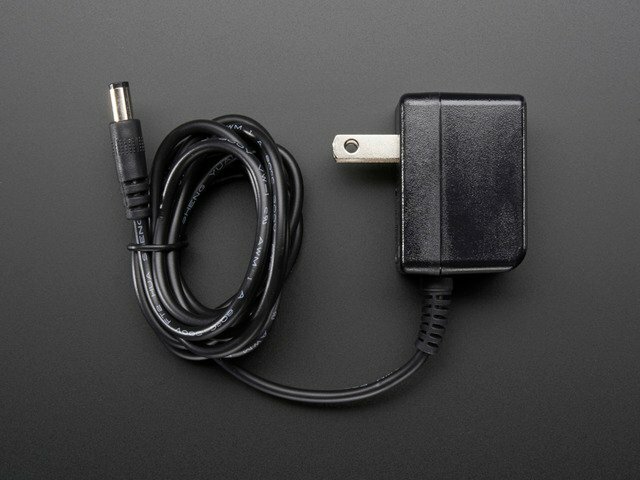 Be sure to supply a power supply to the printer which can provide 5-9V at about 1.5 to 2 amps of current. Printer power positive (red wire) to 5-9V power supply positive. Printer power ground (black wire next to red) to power supply negative / ground. Printer RX (yellow) to board serial TX. Printer ground (black wire next to yellow) to board ground / GND. Printer power positive (red wire) to 5-9V DC power supply positive. Printer TX to one side of a 2.2KΩ resistor. One side of a 3.3KΩ resistor to the opposite side of the 2.2KΩ resistor. Other side of the 3.3KΩ resistor to board ground / GND. Board RX to the junction of the 3.3KΩ and 2.2KΩ resistor (i.e. output of the voltage divider). Again be very careful connecting the printer TX (green wire) to your board! 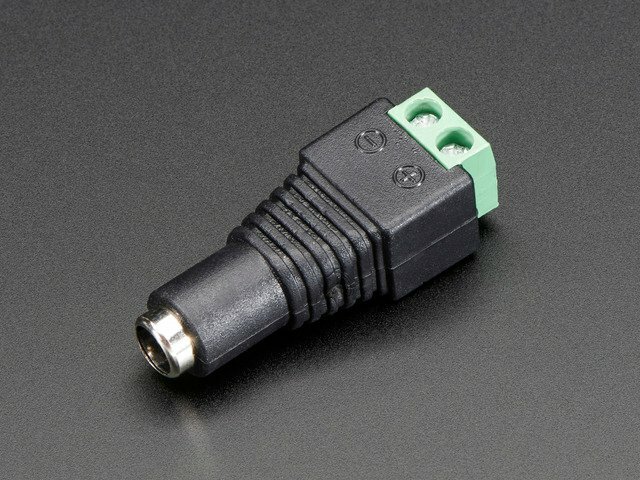 As mentioned above you can damage your board if it does not support 5 volt inputs. When in doubt, leave the green wire disconnected! You can still print without the green wire, you only lose the ability to read if paper is present. If you want to use the built-in UART, you'll need to disable the serial console and enable the serial port hardware in raspi-config. See the UART/Serial section of the CircuitPython on Raspberry Pi guide for detailed instructions on how to do this. Printer RX (yellow) to Pi serial TXD. Printer ground (black wire next to yellow) to Pi GND. One side of a 3.3 KΩ resistor to the opposite side of the 2.2KΩ resistor. Other side of the 3.3KΩ resistor to Pi GND. Pi RXD to the junction of the 3.3KΩ and 2.2KΩ resistor (i.e. output of the voltage divider). USB ground to breadboard ground rail. Printer RX (yellow) to USB TX (green). Printer ground (black wire next to yellow) to ground rail. One side of a 3.3 KΩ resistor to the opposite side of the 2.2KΩ resistor. Other side of the 3.3KΩ resistor to ground rail. USB RX to the junction of the 3.3KΩ and 2.2KΩ resistor (i.e. output of the voltage divider). If you're using a CircuitPython microcontroller, you'll need to install the Adafruit CircuitPython Thermal Printer library on your CircuitPython board. 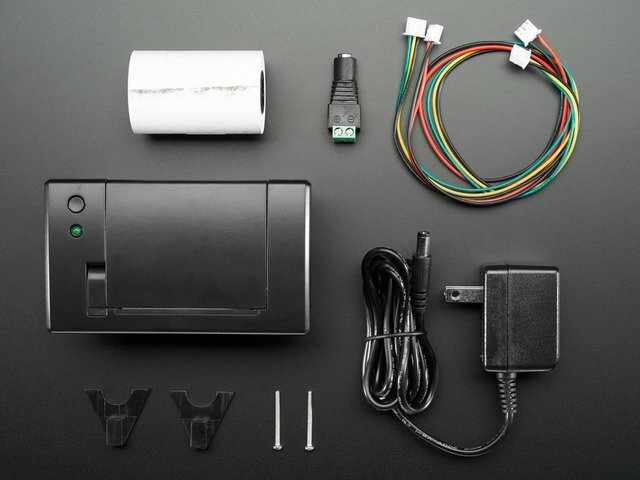 You can also download the adafruit_thermal_printer folder from its releases page on Github. Before continuing make sure your board's lib folder or root filesystem has the adafruit_thermal_printer folder copied over. If you're using a Raspberry Pi or other computer with Python, you'll need to install the Adafruit_Blinka library that provides the CircuitPython support in Python. This may require verifying you are running Python 3. Since each platform is a little different, and Linux changes often, please visit the CircuitPython on Linux guide to get your computer ready! Baudrate - Remember this value, typically 19200 or 9600. Version - Take note of this value too, it's a value like 2.2, 2.64, 2.68, etc. You will use the version to pick the appropriate module for interacting with the printer. To demonstrate the usage of the sensor we'll initialize it and print some text from the REPL. Notice the baud rate of the serial connection is specified with the baudrate keyword. For most printers they'll use a rate of 19200 baud, however other printers might be configured to use a different rate like 9600 baud. Use the baud rate you saw printed on the test page of your printer! Also be aware CircuitPython currently requires bi-direction UART connections so even if you don't have the board RX pin hooked up (as recommended) you must keep the RX pin disconnected and ignore using it in your project. 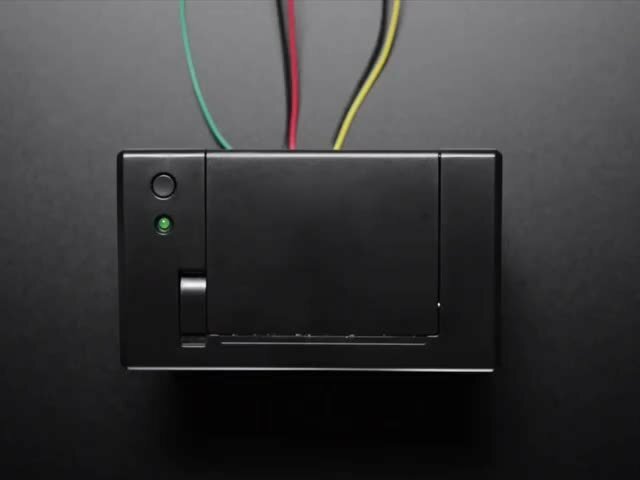 Next you'll need to import the thermal printer module and call a function to get the right class depending on the version of your printer firmware. Be sure you've found the exact version number for your printer by following the steps mentioned above and on the previous test page! Notice you call the get_printer_class function from within the adafruit_thermal_printer module. You must pass this function the version of the thermal printer that you're using and it will internally find the right class to import and use in your code. In this example we're specifying a printer with version 2.69 firmware, but be sure to specify your printer's version! 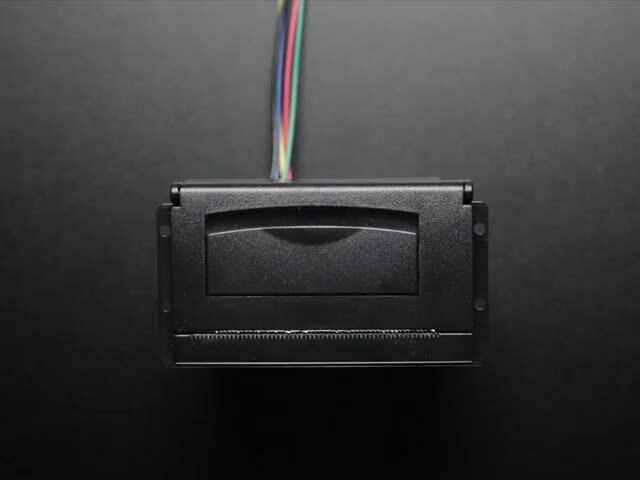 Notice you must pass in the serial UART connection that was previously constructed. Be aware it will take from a half to even 5 seconds for the printer to be created and initialize itself and warm up. You can optionally specify auto_warm_up=False as a keyword and manually call the warm_up function to control when this warm-up time occurs if needed in your application (or you are confused why your code takes so long to start up). Now you're ready to print! You should see the printer test page print out. bold - Print bold text. inverse - Print inverted (white on black) text. upside_down - Print upside down text (might not work on all versions of printers). double_height - Double height size text. double_width - Double width size text. strike - Strike-through text (again might not work on all versions of printers). underline - This controls underline printing and can be None (off), adafruit_thermal_printer.UNDERLINE_THIN, or adafruit_thermal_printer.UNDERLINE_THICK. size - This controls the size of text and can be adafruit_thermal_printer.SIZE_SMALL, adafruit_thermal_printer.SIZE_MEDIUM, or adafruit_thermal_printer.SIZE_LARGE. The default is small. 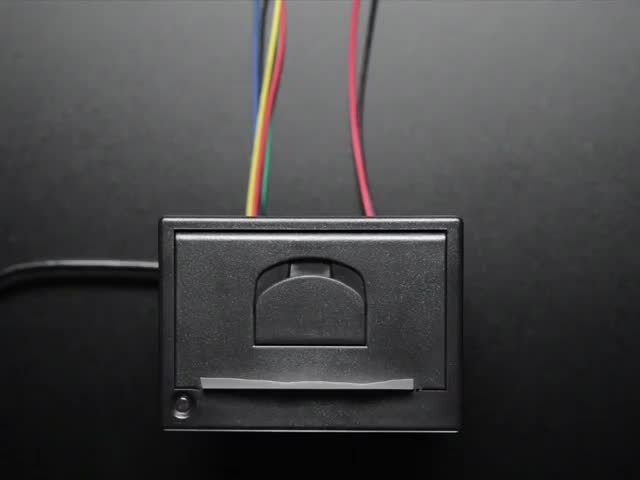 justify - This controls the justification or location of printed text and can be adafruit_thermal_printer.JUSTIFY_LEFT, adafruit_thermal_printer.JUSTIFY_CENTER, or adafruit_thermal_printer.JUSTIFY_RIGHT. The default is justify left. That's all there is to using the thermal printer with CircuitPython! A complete demo of the usage is in the thermal_printer_simpletest.py demo in the library. If you're running thermal_printer_simpletest.py on the Raspberry Pi (or any computer), you'll have to make some changes. On the Raspberry Pi, comment out the uart = busio(...) line, and uncomment the import serial and uart = serial.Serial(...) lines, changing /dev/ttyUSB0 to the appropriate serial port. # Simple demo of printer functionality. # print a test page that displays the firmware version, like 2.64, 2.68, etc. # Use this version in the get_printer_class function below. # Define RX and TX pins for the board's serial port connected to the printer. # functions of the printer will work. # during power-up and it will show the baud rate). Most printers use 19200. # For a computer, use the pyserial library for uart access. # Create the printer instance. # to warm up and be ready to accept commands (hence calling it explicitly vs.
# automatically in the initializer with the default auto_warm_up=True). # Print an inverted line. # Print an upside down line. # Print a double height line. 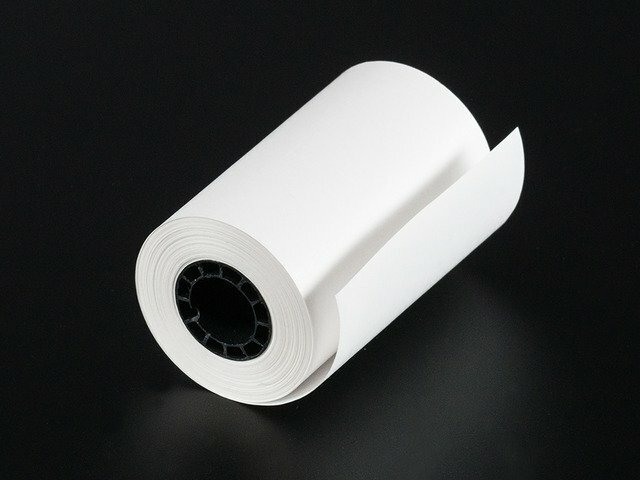 # Print a double width line. # Print a strike-through line. # Print medium size text. # Print large size text. # Back to normal / small size text. # Print center justified text. # Print right justified text. # Back to left justified / normal text. # Print a UPC barcode. # Feed a few lines to see everything. This guide was first published on Sep 02, 2012. It was last updated on Sep 02, 2012. This page (CircuitPython) was last updated on Apr 23, 2019.